Nobber resisted a late Ballinlough rally to become the first winners of Corn na Boinne in the Breen Allcare Pharmacy sponsored competition at Pairc Tailteann on Wednesday night. Sean Meade was Nobber's top scorer from play with four points including the game's final score that ensured Nobber are the first winners of this knockout competition for intermediate clubs. Brian Farrell shared the scoring honours with his team mate by landing four frees including the one that left it 0-9 to 0-5 after 48 minutes. Wing-backs Brendan Heffernan and team captain Niall Farrell (free) accounted for the rest of the Nobber tally. However, Tony Kearney's men were indebted to a diligent defence that ensured the Ballinlough didn't get in for a goal with full-back Brian O'Reilly making one notable interception late on. Scoring was low on a dry night, but there were just eight wides, shared evenly between the teams. Nobber applauded the recently crowned IFC champions Ballinlough onto the pitch. Tom Shine's side lined out without Peader Byrne who subsequently joined in the action in the 39th minute. Within four minutes of his introduction, Byrne landed a free - his side's first score of the second period - that left Ballinlough trailing by 0-4 to 0-8 midway through the second half. Sean Geraghty's 46th minute point at the town end was Ballinlough's first score from play, but more importantly left just a goal between the teams, 0-5 to 0-8. A Brian Farrell pointed free from 45 metres kept Nobber in the driving seat. While Ballinlough had a penalty claim waved away, Nobber captain Niall Farrell was wide from a close range free at the old swimming pool end. Ballinlough rallied with two points from play - Geraghty's second and one from sub Ken Rothwell - to half their deficit and leave the nearby board reading 0-7 to 0-9. That was as good as it got for Tom Shine's men on the night who still have their sights on the Leinster Club IFC and the A FL Division 2 final. Nobber are left to savour a notable achievement after salvaging their IFC status. 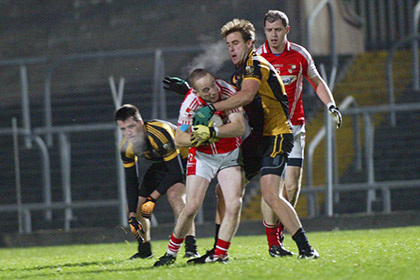 Ballinlough lost Kevin Devine to a harsh black card in the opening minute. The sides exchanged pointed frees in the opening eight minutes with Ballinlough's Colm Mallon first to register. Nobber wing-back Brendan Heffernan was the first to notch a point from play. He then set up Sean Meade for the score that left it 0-3 to 0-1 after 12 minutes. A Brian Farrell free moved Nobber 0-4 to 0-1 clear midway through the opening half.. A second Colm Mallon free kept Ballinlough in touch. The exchange of pointed frees continued until the 23rd minute when Sean Meade posted his second score from play that earned Nobber a 0-6 to 0-3 interval advantage which they carried to half-time. Ballinlough's three first-half scores came courtesy of Colm Mallon frees. The opening 30 minutes yielded just three wides with two going to the recently crowned IFC winners. Apart from Devine's black card, there were few moments of note in the opening period. Three involved Nobber wing-back Brendan Heffernan. He scored one point, made another and might have got a black card instead of yellow one for a 25th minute foul. Ballinlough resumed with Cian Mallen and Tommy McCullen at midfield. However, Nobber were first to show with Meade posting his third point. A third pointed Brian Farrell moved the men in black and amber 0-8 to 0-3 clear after 41 minutes. Nobber - Christopher O'Reilly; Stephen O'Brien, Brian O'Reilly, Andy O'Brien; Brendan Heffernan (0-1), Fiachra McEntee, Niall Farrell (C) (0-1f); Richard Shields, Gavin Farrelly; Brian Kelly, Jamie Owens, Karl Casserly; Sean Meade (0-4), Brian Farrell (0-4fs), Pauric Weldon. Subs - Dale Larkin for Casserly (51), Derek Campbell for Kelly (59), Paul Meade for Shields (60), Padraig Fox for Weldon (60). Ballinlough - Keith McGuinness; Benji Smith, Pauric Muldoon (C), Robbie Farrell; Lorcan Maguire, Colm Mallon (0-3 fs), Johnny Reilly; Jack Tunney, James Baugh; Junior Reilly, Sean Geraghty (0-2), Cian Mallen; Simon Deevey, Tommy McCullen, Kevin Devine. Subs - Ken Rothwell (0-1) for Devine (2 black card), Peader Byrne (0-1 f) for Junior Reilly (39), Emmet Smith for R Farrell (42), Jonathan O'Reilly for Tunney (48), Michael Geraghty for Deevey (60).